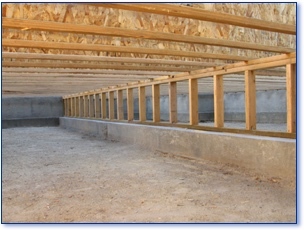 Real Dry Waterproofing understands the health hazards of a wet or damp crawl space in your home. Unmanaged moisture means damp air that allows mold and mildew to flourish – and damage your health and home. We provide custom crawl space moisture solutions throughout Massachusetts, western Massachusetts, Cape Cod, Boston, the South Shore, northern Connecticut & Rhode Island, and southern New Hampshire. If it's in poor condition, your crawl space can actually be making you sick. When warm air in a home or building rises, it gets replaced by the air located in the lowest part of your home: The crawl space. 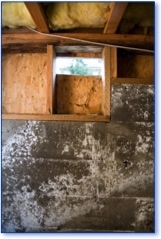 Both dirt and concrete floors in a crawl space emit moisture into your home. This moisture then moves upward into your living areas via air movement known as the "stack effect". This means that you may be breathing damp, unconditioned air as much as 40% of the time. Securing the crawl space in a home can sometimes be a multi-step process. The humidity and musty odors resulting from mold and mildew infestation are a prime concern, and eliminating these factors is essential for the health and well-being of your home and family. Real Dry Waterproofing employs one of the most effective and reliable approaches to solving all manner of crawl space problems: Crawl Space Encapsulation. and foul air out of the living areas of your home. Don't be fooled – some contractors use simple, thin plastic liners as vapor barriers that offer no UV (ultraviolet) protection and very little durability. They're also porous and fail to provide complete protection against continued damp air infiltration into your home – and your lungs! By contrast, Real Dry uses barriers by Flexi-Seal to protect your home and family. 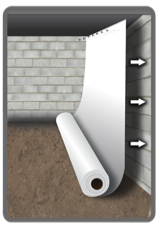 These are the highest-quality vapor barriers available, and we cover the entire crawl space floor as well as the foundation walls with them so that your home is truly shielded from the effects of a moisture-filled crawl space. Flexi-Seal is a fiber-reinforced flexible membrane used to create a continuous, permanent barrier from external moisture and the earth gases in crawl spaces and basements. 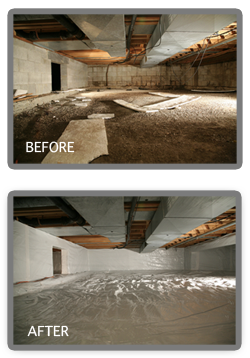 It can transform a dirty, damp crawl space into a clean, dry storage space. Flexi-Seal is strong and durable enough to be walked on, and it exceeds all ASTM E-1745 requirements for a vapor and moisture barrier – which is why we at Real Dry feel comfortable recommending it for your home. Call 1-855-DRY-TODAY or us to learn more about our crawl space moisture barrier and encapsulation solutions. Proudly serving MA, northern CT & RI, and southern NH. A quality vapor barrier is essential for moisture mitigation, but depending on several other factors such as . . .
. . . you may be best served by the installation of a custom dehumidifier solution as well. Keeping the air in your crawl space dry is essential for healthy living – and that's where a special crawl space dehumidifier can be appropriate. 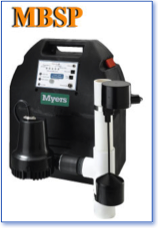 Real Dry can install a dehumidifier unit that's precisely-sized to your specific crawl space as part of a comprehensive moisture-control approach to keeping your home clean and dry. 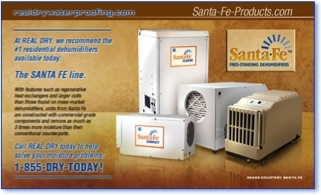 At Real Dry we install the number one residential dehumidifier on the market today – the Santa Fe line of dehumidifiers. the conditions in your crawl space. Controlling the humidity levels in your home is key in protecting your home, health and family. 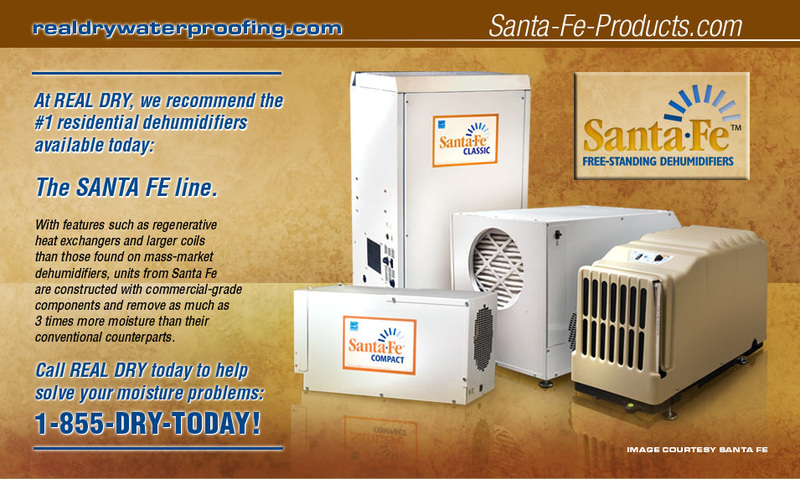 After many years of installing them, we've found Santa Fe dehumidifiers to be an affordable solution to our customers' humidity problems. 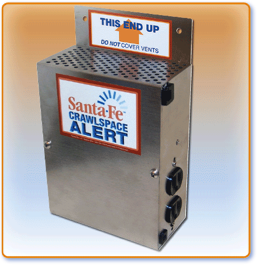 A Santa Fe dehumidifier comes with a five year limited warranty. We install them because they can save you up to $250 or more per year in energy costs over conventional dehumidifiers, and that doesn't take into account the savings that you'll realize as a result of raising your thermostat and reducing your air conditioning costs. Once you're able to maintain a consistent relative humidity of 50% or less, you won't need to keep your thermostat set at low, uncomfortable temperatures in an effort to control humidity. A Santa Fe free-standing, energy-efficient dehumidifier will not only pay you back in energy savings, it'll also create a more comfortable living space – leaving you and your family satisfied. And at Real Dry that's been one of our primary goals throughout our entire history . . . to leave you and your family satisfied! Call us at 1-855-DRY-TODAY and we'll inspect your crawl space at no charge. If your crawl space floods or leaks – even intermittently – then you may be a candidate for the installation of a drainage system. 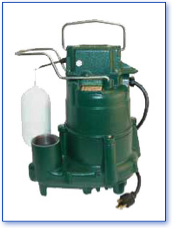 Water is the enemy of a healthy crawl space, and in addition to a vapor barrier, Real Dry can easily install a sump pump system in your home to eliminate any trace of water infiltration. A battery backup system can even keep your crawl space dry and clean in the event of a power failure. by one of the Real Dry owners, you'll receive expert advice that's tailored to you and your unique situation. We've never applied standard, Band-Aid® approaches to our customers' moisture or water problems and we never recommend basic, off-the-shelf solutions without giving your specific problem careful consideration. Contact us now and we'll set up a visit to assess your problem and get it solved in the most efficient, effective, and inexpensive way possible. Tell us a time that's convenient for you and we'll be there to tackle your one-of-a-kind issue.